By Andrew Jeromski -- Officials from the Boston Transportation Department and consultants from Tetra Tech presented what they billed as a third, “hybrid” option for the redesign and redevelopment of the Rutherford Avenue/Sullivan Square corridor [on May 9, which] melds elements of both the “surface” and “tunnel” options into a new, “hybrid” plan, featuring the removal of the underpass at Sullivan Square, while the Austin Street underpass would be rebuilt.... But judging from the reactions of the crowd, the new plan does little to address concerns -- real or not -- about traffic diverting through the middle of the neighborhood rather than remaining routed around the outsides, and it did not appear to do much in the way of bringing the two sides any closer together. By Rebeca Oliveira -- The design phase of the Casey Arborway project began with a discussion on parking, bus traffic, street names and the announcement of Shea Circle’s future: a standard intersection to be named Shea Square. While the design has been assumed to be future of the rotary for months, it was finally announced as the state Department of Transportation’s (MassDOT) official decision at the first Design Advisory Group (DAG) meeting on April 30. 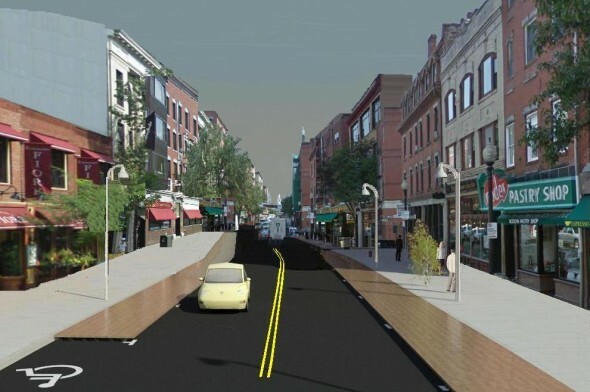 By Marie Szaniszlo -- A group of recent Northeastern University engineering graduates has proposed an innovative way of easing pedestrian gridlock on Hanover Street in the North End: portable sidewalks. Civil engineering professor Daniel Dulaski said he asked his students to form teams similar to consulting firms to design a “complete street,” one that would accommodate vehicles, pedestrians and bicycles. By Paul McMorrow -- More than 18 months ago, state transportation officials announced a major federal grant that would enable them to expand South Station in Boston. But the state hasn’t tapped the funds yet, and it’s beginning to look like it may not happen for awhile. The $32.5 million federal grant, drawn from high-speed rail stimulus funds, was supposed to pay for permitting and engineering work at the congestion-choked rail terminal. After an extensive delay on the federal side, the South Station project is now being dogged by delays at the state level. By Alli Knothe -- It’s official: Riding a bicycle is the fastest way to travel from Davis to Kendall squares during rush hour. This morning, LivableStreets Alliance, the Somerville Bicycle Committee, and the Cambridge Bicycle Committee hosted a rush hour race between a biker, an MBTA rider, and a driver. By Andrea Bernstein -- A federal program to encourage biking and walking in four communities — Columbia, MO; Marin County, CA; Minneapolis, MN; and Sheboygan County, WI, is meeting with success, according to a new bike month post by Transportation Secretary Ray LaHood on his Fastlane blog. By Jean Zove -- North Quincy & Wollaston (NoQuWo) area residents can sign up now to play NoQuWo: Neighborhoods on the move, the online game that will help plan the future of their community. This game is part of the” next generation” of online gaming technology as a planning/visioning community engagement tool and launches this Saturday, May 5 with a launch party in Quincy. The development of NoQuWo drew on lessons learned from our first project CommunityPlanIt collaborative project, Participatory Chinatown.